Be the first to share your favorite memory, photo or story of Genevieve. This memorial page is dedicated for family, friends and future generations to celebrate the life of their loved one. 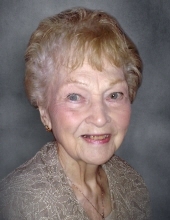 Genevieve M. Quinette, 88, passed away on Wednesday, December 5, 2018 with her family by her side at Rennes Nursing Home in De Pere. She was born on March 19, 1930 in Green Bay, to the late Felix and Johanna “Mamie” (Vande Hei) Calaway. Genevieve married Donald J. Quinette on April 7, 1951 at St. Boniface Church, in De Pere. She spent her years at home raising their eight children. Homemade bread was a specialty that Gen shared with her family and friends. Gen worked alongside Don at their small businesses, she also worked in retail at the Lee Store and the White Store in De Pere. Gen co-founded the Green Bay Chapter of the Hemophilia Association, a cause near and dear to her heart. Genevieve was dedicated to others; she “just loved people.” Gen regularly sang “You Are My Sunshine” to her children, grandchildren and great-grandchildren. She was a woman of deep faith, volunteering over the years at St. Boniface, Our Lady of Lourdes, De Pere Christian Outreach and Rennes Nursing Home. At her home, she was surrounded by a collection of angels, which along with her prayers brought her great comfort. Genevieve leaves behind her children: Donna (William) Haworth, Debbie Quinette, Ginny Gildernick (Ken Fleischman), Gail (Rick) Schmitz and Denise Alexander (Rick Voigt); daughter-in-laws: Anne Quinette, Mary Kay Plesser and Patti Quinette. She will also be sadly missed by her 17 grandchildren and 12 great grandchildren. Genevieve is further survived by her brother, Ronald (Barb) Calaway and in-laws, Marge Calaway, Dolores Calaway, Kathy Wilmet, Nancy Calaway, Harvey (Nancy) Quinette, Harold Quinette, Tom Quinette and Ken Collaer. In addition to her parents, Genevieve is preceded in death by her husband, Donald, their three sons: Glen Quinette, Daniel Quinette and Gregory Quinette; and her siblings, Jerome Calaway, Kenneth Calaway, Neil Calaway, Paul Calaway and Irma (Robert) Ulmen. She is further preceded by her in-laws, Bernard (Jane) Quinette, Nikki Quinette and Mary Collaer. Friends may call at Ryan Funeral Home, 305 N Tenth St., De Pere, after 4:00 pm on Monday, December 10, 2018. A prayer service will be at 7:00 pm. Visitation will continue at Our Lady of Lourdes Parish Family, 1307 Lourdes Avenue, De Pere, Tuesday, December 11, 2018 from 9:00 am until 10:30 am. A Mass of Christian Burial will begin at 10:30 am with Fr. Benny Jacob, O.Praem. officiating and Deacon Harvey Quinette assisting. In lieu of flowers, memorial donations will be accepted in Genevieve’s name. The Quinette Family would like to thank Dr. Ruth Warren, Dr. Rhonda Steffel, and the caring staffs of St. Mary’s Hospital 5th Floor and Rennes Nursing Home. To send flowers or a remembrance gift to the family of Genevieve M. Quinette, please visit our Tribute Store. "Email Address" would like to share the life celebration of Genevieve M. Quinette. Click on the "link" to go to share a favorite memory or leave a condolence message for the family.